We’ve received incredible feedback on The Dovecraft Fairy Tales collection over the last few weeks, it has truly wowed you all! So much so, we have decided to include it in our Monthly Competition! 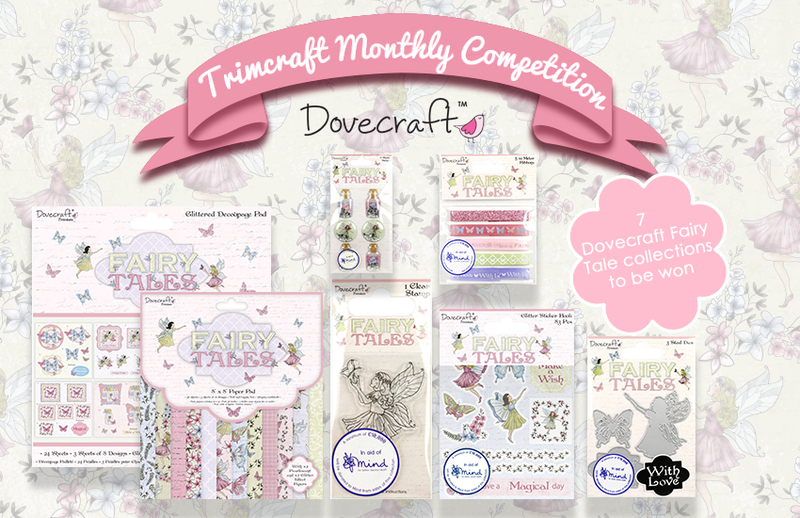 For the chance to win a bundle of the Dovecraft Fairy Tales collection, read on to find out how you can enter! As the name might suggest, this collection features intricately drawn illustrations of fairies, flowers, and beautiful butterflies, alongside scintillating glitter and pearlescent detailing. In stunning shades of pink and purple, as well as a charming paper pack, this collection also features a glittered decoupage pad, glittered sticker book, fabulous ribbons, shaker stickers, cute clear stamp and 3 whimsical cutting dies (all of which are included in the bundle)! With all these designs and embellishments, you’ll have the perfect collection for any occasion, perfect for any papercraft and upcycling project you have! Amazing prize, I have the fairy stamp but haven't managed to get any of the rest of the collection yet. What a lovely bundle prize!!! Fingers crossed!!! My Grandaughters would love to help me make cards if I won this prize. Such a pretty collection, always such great competitions here. My granddaughter would go nuts for this collection. Another winner.